Not long ago we told you about Assault Android Cactus, an action shooter from Australian developer Witch Beam that's targeting a Q1 2014 release on the Wii U eShop. With a top-down perspective and plenty of twin-stick mayhem potentially on offer, it looks like it could be a stylish slice of fun. For those lucky enough to have a ticket for the Eurogamer Expo, Witch Beam has confirmed that the PC build of the game — due later this year — will be on show at the Indie Game Arcade area of the show. We'll be going hands-on and having a chat with the developer, and the studio's co-founder Sanatana Mishra has also given us a few pointers into the control options that will be planned for the Wii U version. For starters we will definitely be supporting off-screen play and also the use of practically any controller configuration, Wii Remote + Nunchuck as a replacement for Keyboard/Mouse and the twin stick pads. GamePad specific elements are still a bit TBD as we need to be careful to avoid gimmicky tacked-on gameplay, so I imagine we won't be talking about them until much closer to the Wii U version's release. The Wii Remote pointer has often been considered by some — particularly in FPS titles or fantastic shooters such as Sin and Punishment: Star Successor — as the most accurate control scheme for aiming aside from the mouse and keyboard. Not everyone will agree with that, but it's encouraging that the option will be included. 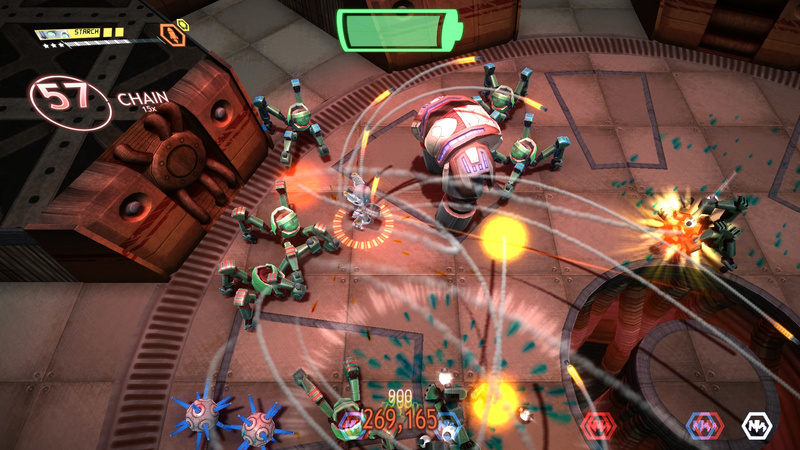 If you missed it before you can check out the trailer for Assault Android Cactus below. Yeah, remote+nunchuk work wonders when it comes to shooters. I kinda miss that, although after Zombi U I'm already used to twin sticks. I've never used that control scheme before, so at first it was quite awkward. Count me as one of those who don't agree with it when it comes to "2D-plane shooters". Even on PCs I prefer a pad in "twinstick" shooters, with one exception. Personally, I find it more intuitive to shoot in a direction on a plane rather than at a point in a plane, when the purpose is to clear the path of enemies when I wish to move the player avatar in that direction. I'm disappointed that you don't get to play as an actual Robot Cactus. One of the easiest Day Ones I'll ever declare. Looks smashing. Shooting in 8 directions using the face buttons works fine for me as well. The only thing I can remember that really needs 2 sticks is Virtual On. (And it needs its designed controller). For FPS I use keyboard and Mouse. (Twin Stick for FPS is rubbish). The Wiimote pointer is even better than a mouse when it comes to moving a cursor around the screen. With a simple movement of your wrist, you can move the cursor anywhere you want on the entire screen instantaneously with extreme precision. Dragging the cursor with a mouse is a bit slower and less accurate in comparison. When it comes to reticule-based shooters, I'd take the Wiimote and Nunchuk over Mouse and Keyboard any day. Mouse still beats Wiimote when it comes to controlling a first person camera (as in FPS games), though. Me too. It actually halved my interest for the game. It reminds me A LOT of Smash TV.....which is a very good thing. This game needs to be supported......so yes, day 1 purchase for me as soon as I get a Wii U.